“Replacing traditional computer chip components with light-based counterparts will eventually make electronic devices faster due to the wide bandwidth of light. A new protective metamaterial “cladding” prevents light from leaking out of the very curvy pathways it would travel in a computer chip. Because processing information with light can be more efficient than with electrons used in current devices, there is good reason to confine light onto a chip. But light and the bits of information it carries tend to leak and scatter out of the tiny components that must fit on a chip. A Purdue University-led effort has built a novel cladding along the highways for light travel, called waveguides, to prevent information leaks – particularly around sharp bends where light bounces off track and scatters. Information then gets lost or jumbled rather than communicated throughout a device. 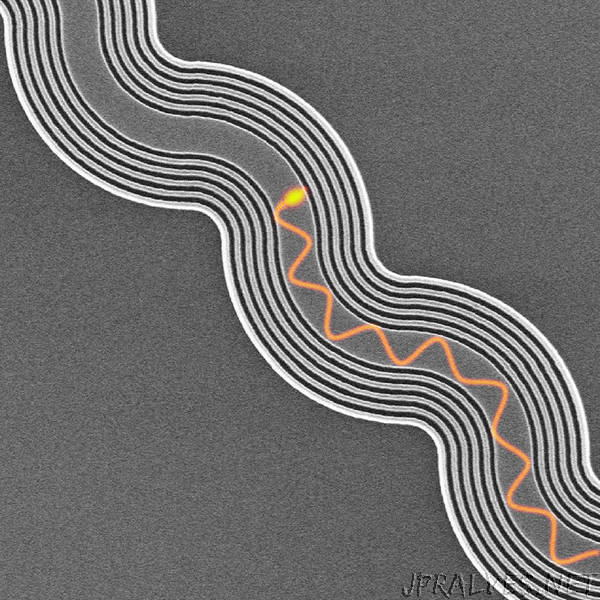 Preventing this could facilitate the integration of photonic with electric circuitry, increasing communication speed and reducing power consumption. “We want the bits of information that we are sending in the waveguide to travel along tight bends and simultaneously not be lost as heat. This is a challenge,” said Zubin Jacob, Purdue assistant professor of electrical and computer engineering. What makes the waveguide cladding so unique is anisotropy, meaning that the cladding design enables light to travel at different velocities in different directions. By controlling the anisotropy of the cladding, the researchers prevented light from leaking off track into other waveguides where “crosstalk,” or mixing, of information would occur. Instead, bits of information carried by light bounce off by “total internal reflection” and stay strongly confined within a waveguide. This work was performed by an international team of researchers at Purdue University, University of Alberta, Texas Tech University, the University of British Columbia and the Shanghai Institute of Microsystem and Information Technology. The team’s findings appear in the journal Nature Communications.